Considering how much we love our food, it’s a little surprising that we hadn’t yet eaten at ethos. 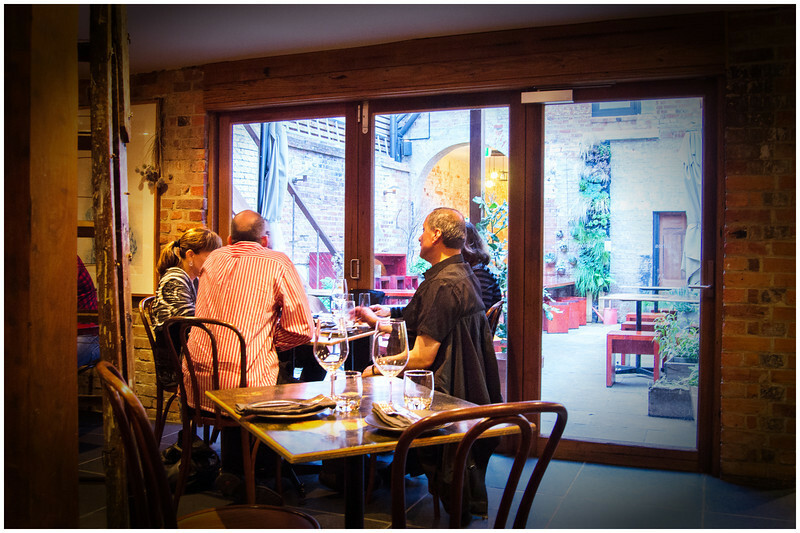 Opening in 2011, this restaurant has received rave reviews ever since, both for their food and for the sustainable environment in which it is served. 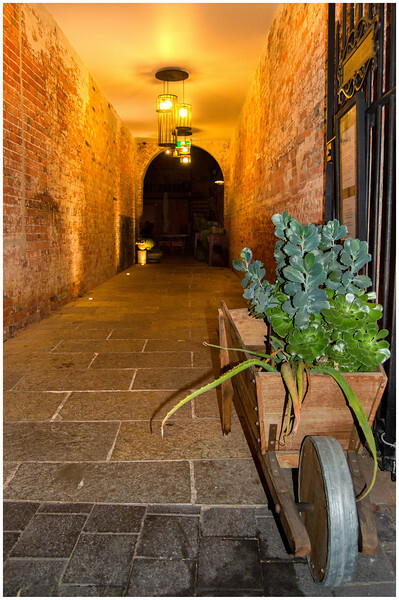 The building itself has existed since the early 1800s, with the latest renovations making exceptional use of the limited space, ensuring the site retained much of its old world charm. To their credit, the ethos crew were quite particular in their desire to reuse as much of the ‘waste’ reclaimed through the building process as was possible. The result being some rather unique light fittings and other intriguing meldings of form and function both inside and outside the restaurant! 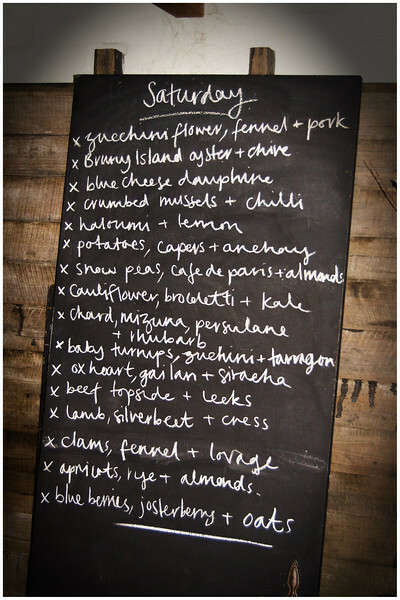 Having checked their website prior to making the booking, we were prepared for the degustation style menu on offer. However, where ethos do things a little differently is that out of the sixteen dishes on the menu, it’s up to the whims of the chef as to which ones you’re going to end up with! Not a problem as far we were concerned, but those with specific dietary requirements are given the opportunity to speak up. It did also make it a little difficult to select an accompanying bottle of wine, but chances are you’ll get at least one or two that will match either a red or a white. From what I hear, the menu is constantly changing depending on what’s in season, so don’t bank on the dishes below being available when you next visit! Being a celebratory dinner, we began the evening with a couple of glasses of a ‘real’ champagne, the Billiecart-Salmon Brut Reserve from France. Perhaps a little sweeter than we normally prefer, but still very fine (and no fish were harmed in the making of this wine). Together with the wine we were served a couple of pieces of freshly baked bread, with butter and salt. In fairly quick time we were brought our bottle of Priory Ridge Sauvignon Blanc (taking a punt that we would be served some ‘white’ food!) and were served our first meals for the evening, consisting of a small bowl of olives and cornichons, and two blue cheese dauphines. All very tasty, with the dauphines being surprisingly mild in flavour. I was expecting a big hit of musty, blue cheese funk, but it was actually quite restrained. 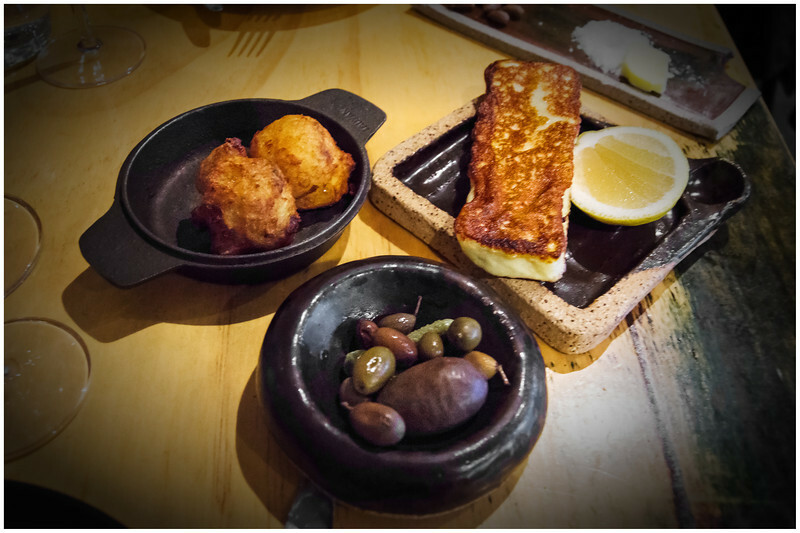 Before we had finished these appetisers we were brought our next dish, a large slab of fried haloumi with lemon. Initially filling the mouth with hints of lemon drizzled pancakes, the subtle flavour of the haloumi eventually won through. The texture of this haloumi was also very very good. It’s not uncommon for haloumi to be rubbery and ‘squeaky’ on the teeth, but this one was very delicate. Personally I would have preferred it to be a little less oily, but again not a major criticism. While the haloumi was perfect in size for two people, you’d have to be a real haloumi lover to get through one of these on your own! What you are looking at is one of the most surprisingly delicious dishes I have tried in a long long time! 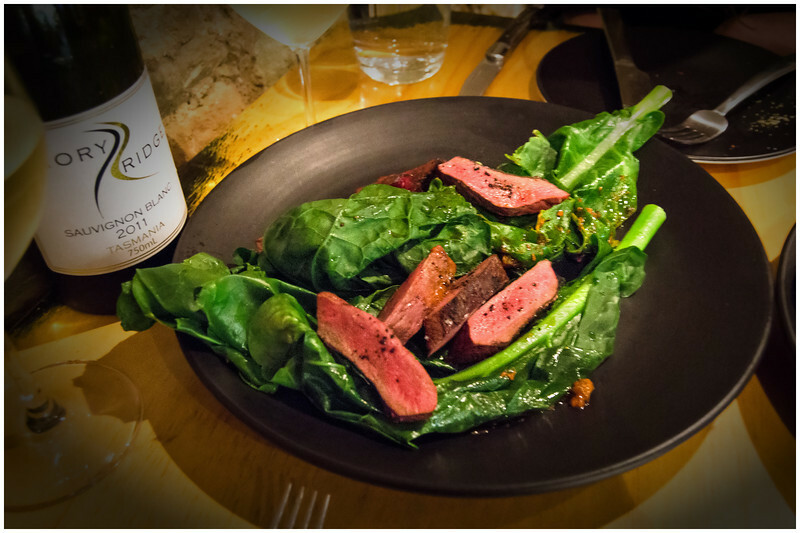 It is actually ox heart, served on a bed of gai lan (Chinese broccoli) with a sriracha sauce. Surprisingly, I had never tried any one of those ingredients before, let alone mixed together in the same dish! Unlike other hearts that I have tried before that were tough and gristly, the ox heart was tender and full of flavour. Full credit to the chef because I can’t imagine that it would be easy to cook this dish so well. The gai lan gave a nice textural contrast to the heart, while the sriracha sauce provided a sweet and spicy kick to the meal. As we were making our way through the heart, our next dish was brought out. This time it was a vegetarian grilled zucchini with baby turnips. Again, this was another perfectly cooked dish. While the turnips didn’t do much for me, the zucchini was fantastic. 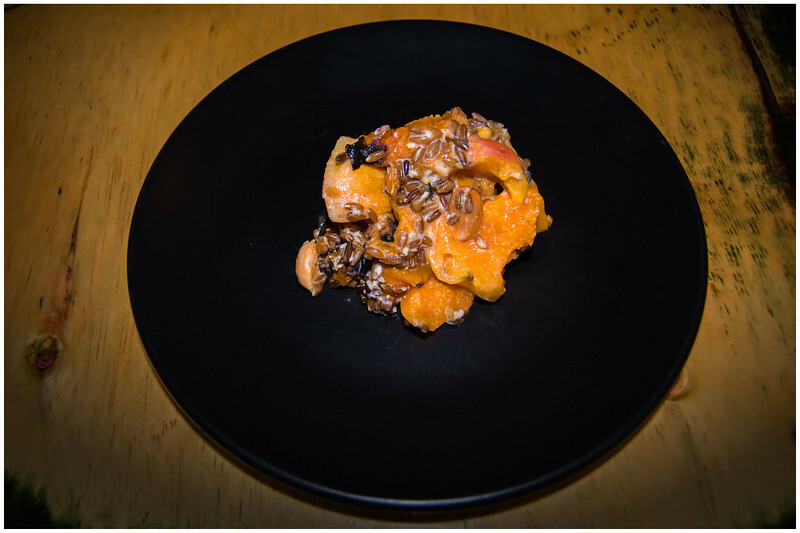 To close the meal out we finished with an unconventional, yet superb dessert consisting of roughly chopped apricots, boiled rye and almonds. This isn’t a combination that immediately comes to mind when I think of dessert (chocolate…), but it was one of the best I’ve had in a long time. The apricots were perfectly ripe and full of juice, while the rye gave the meal some consistency and depth, with the almonds offering some good crunch in the mouth. An absolute winner! While overall we were extremely happy and satisfied with the meal, there were a couple of tiny gripes that stopped this from being one of our all-time great meals, dropping it from a 5/5 down to a 4/5. The service was excellent at times, but also poor at times. Very friendly and willing to please, but there was some confusion early in the meal as to whether we needed additional wine glasses or not, arising from a lack of communication between the two waitresses who had been assigned to our table. Also, while slow service is almost always an annoyance, in this case they were actually much too fast in bringing out our meals. We had barely drunk half a glass of champagne when the first main meal and our bottle of white wine was brought out. Maybe it’s just me, but a pre-dinner drink should be just that…a PRE dinner drink. And while I don’t enjoy waiting forever, it’s always nice to relax for 15-20 minutes or so while drinking that pre-dinner drink, chatting and nibbling on bread, rather than being made to feel like you’re running behind schedule. However!!! These issues were more than balanced by one particularly gracious action halfway into the meal when I made an offhand comment to the waitress that our choice of white wine was probably not the best in hindsight, considering the types of meals we were served. The waitress promptly returned with two half glasses of red wine (Kate Hill Cabernet Merlot) to accompany the beef dish, on the house. Completely unexpected and unnecessary, yet it’s those human touches that you’ll remember months later when planning your next special meal. 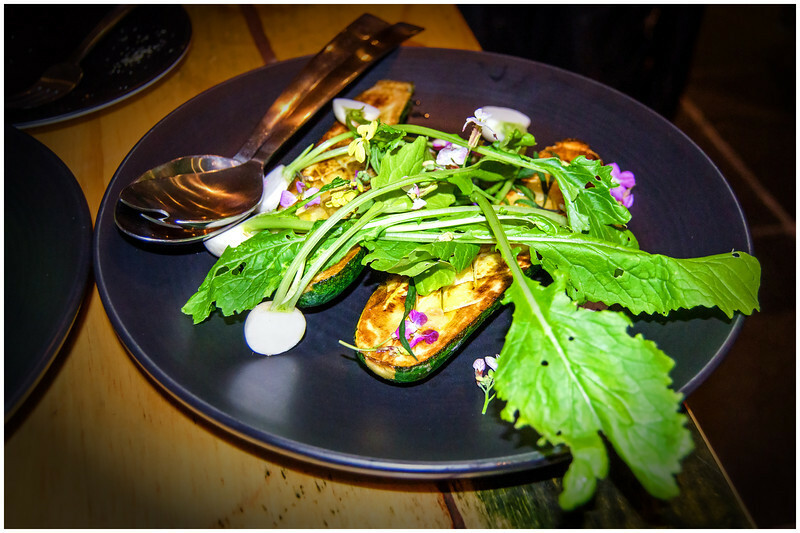 So in summary, dinner at ethos|eat drink was an amazing experience and well worthwhile. 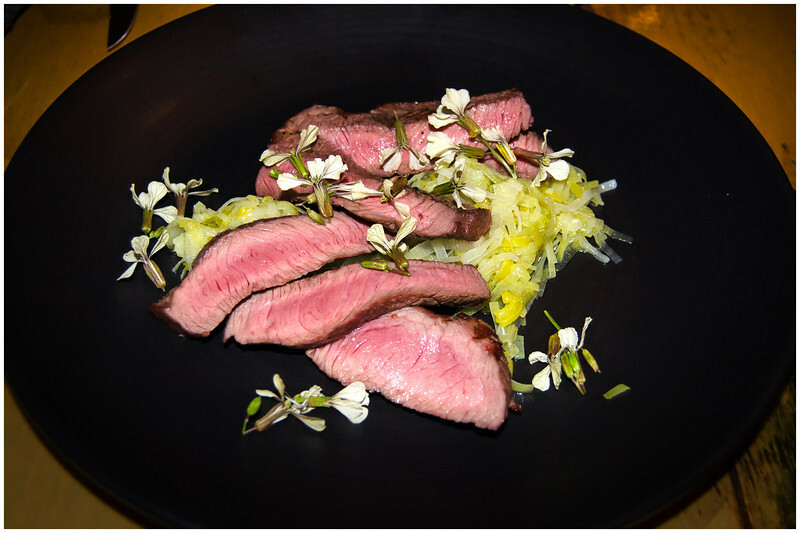 It was also extremely good value considering the huge variety in dishes, the superb quality of the produce and the culinary skills that were clearly evident, with the degustation only costing $65 per person. Would we eat there again? You bet!! 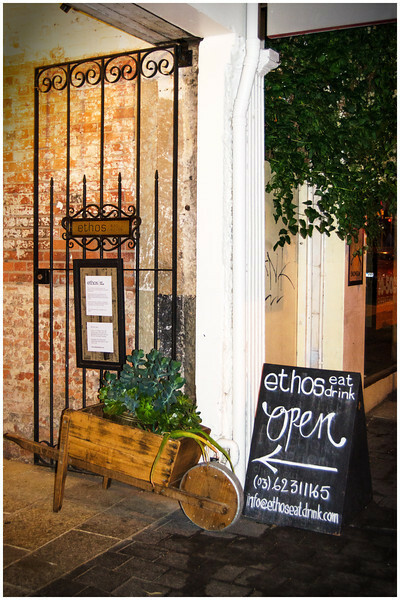 ethos|eat drink is one of Hobart’s finest establishments, setting a very high standard to which other restaurants in Hobart should be aspiring. Great write up, Andrew! Very detailed and informative. Pictures are making me hungryyyyy! I know..One day, I would love to visit Tasmania! Perhaps 2014!